Galvanized steel gutters are coated in a thin layer of zinc. The extra layer of coating serves to add protection. Because of this, they can better resist water, and weather, as well as physical damage. This material can also be painted over to meet style preferences, and to help increase protection against the elements. Thermal warping also is not an issue with galvanized steel, which makes it better in hot, or rapidly changing environments. Galvanized steel is among the most durable materials you can choose for your gutter system and is less likely to crack under the pressure of wind gusts, falling branches, or collected yard waste, such as leaves, twigs, and mud. When compared to stainless steel, galvanized steel can be cleaned much easier than stainless. Chlorine-based bleaches can destroy the oxide layer on stainless steel, but not with galvanized. As far as installation, both types of steel are relatively easy to install, but galvanized steel weighs less and is easier to cut. 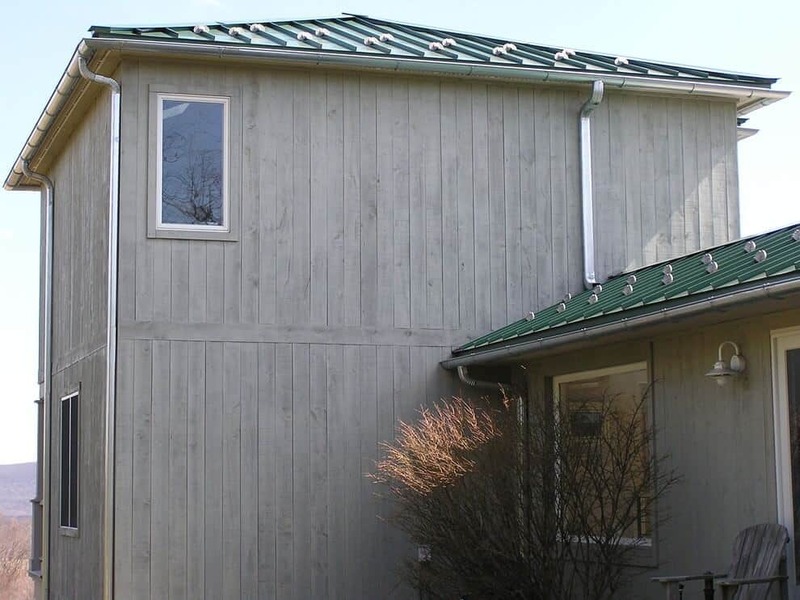 Galvanized gutters are often installed on contemporary style homes, barns and farm homes. The unique mill finish can really compliment the right home or project. These gutters were the perfect choice for the featured homes in the photos to the right. Galvanized gutter systems are also very cost efficient. They are fairly inexpensive when compared to copper, and are available in both Half-Round and K-Style. They are not available in seamless.